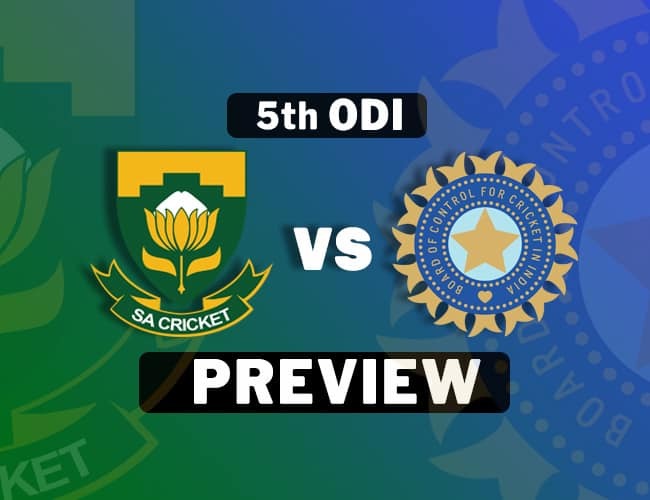 Welcome to our Preview for SA vs IND 5th ODI. The match will be played at the Saint George’s Park, Port Elizabeth and This is our Dream11 probable playing XI for India vs South Africa 5th ODI. India is leading 3-1 in the series. South Africa looked like a totally different unit when they were batting in pink in the last match. After Miller got a double reprieve thanks to Iyer and Chahal, he did not look back. Miller, Klaasen and later Phehlukwayo all treated themselves slamming fours and sixes. With ABD back this South African batting has restarted afresh. Indian batting is relying heavily on Dhawan and Kohli, it clearly showed in the fourth ODI when the middle order failed to score rapidly and put up a huge total on the board. In last 15 overs, India could add only 83 runs. Bowling can be forgiven as they had to deal with wet conditions but no-ball can’t be pardoned. No updates on Kedar Jadhav’s fitness yet, if fit he will come into the 11 replacing Shreyas Iyer. On a slow pitch, SA is likely to bring back Imran Tahir. After his performance in the last match, Phehlukwayo looks fixed in the team. So Ngidi may be removed to accommodate Tahir. In WK, Klaasen is a better option. Kuldeep and Chahal are obvious picks. Bumrah and Rabada are doing well. Do Let us know: Will India be able to pull off the ODI series in this match? If you liked SA vs IND 5th ODI Preview, then please subscribe to our Email Newsletter For Latest cricket News, Fantasy Previews, Playing XI and All information about Dream11 Fantasy Cricket. You can also find us on Twitter, Google+ Group and Facebook.